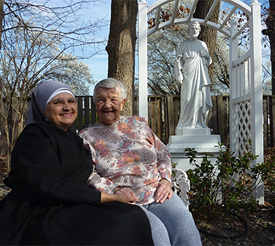 Donate to Our Home - Little Sisters of the Poor Virginia - Support us today! Give Online This is an easy, secure, and fast way to make a one-time donation or set up an automatic recurring donation. Planned Giving: Planned gifts can be made through a will, estate plan or a deferred gift such as an IRA or retirement fund, life insurance policy, or charitable trust. Donors are encouraged to consult with a financial advisor, accountant, or attorney prior to making a gift. Stock Transfer: Please contact the Development Office for instructions. Employer Matching Gifts: If your employer provides a matching gift program that may double your gift, please include any forms your company requires along with your check. Commonwealth of Virginia Campaign: Our CVC code is: 3659. Memorials and Honorariums: Gifts may be made in memory of a loved one, to honor a special person in your life, or to recognize a significant anniversary or achievement. When making such a donation, please include the name of the deceased or the person you are honoring. If you would like for your honoree to be notified, please also include their mailing address. Gifts in Kind: Call Sr. Rose Marie at (804) 248-0101 if you have or would like to donate goods or services. While we are so grateful for your kindness, we are limited to what we can take in due to storage capabilities, as well as other health and safety limitations. Please do not bring items to donate to the Home without prior approval from Sr. Rose Marie or Mother Marie. Even the most well-meaning donations can cause unintended expense or difficulty if we need to pay to have them removed or dealt with. Thank you for your kindness and understanding. AmazonSmile: Click here to sign up for AmazonSmile. Once you’re enrolled, Amazon will donate 0.05% of every eligible purchase you make on their website to the Little Sisters of the Poor. As a 501(c)(3) charitable organization, donations to the Little Sisters of the Poor are tax-deductible to the full extent allowed by law.Our corporate name is: Little Sisters of the Poor in Richmond. A financial statement is available on request from the Commonwealth of Virginia Office of Consumer Affairs.